If I have to be honest, there have only been a few rotary-powered cars that have special appeal or are massively significant in the world of modified cars, and no, I am not talking about your mates 808 with a fibreglass 12A nosecone. For me, and I think many would agree, there is, of course, the Mazda 787B, the 26B quad-rotor race car that dominated Le Mans in 1991. Then there is the Racing Beat FC3S RX7 that set an E/BGT record of 238.4 MPH at Bonneville in the 80s and it would be sacrilege to not mention the crazy-fast and arguably, best looking time attack car ever, the Panspeed RX7. Even drift king Mad Mike has done his fair share for the Mazda marque too, killing tyres and winning fans all over the world. 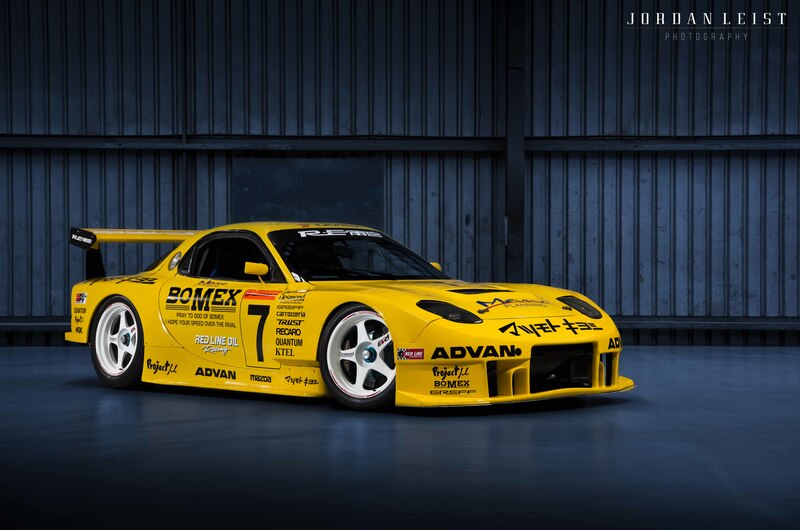 Those are all amazing cars that all did their bit to ‘up the rep’ of Felix Wankel, and then, there is this car – the last one on my list – the RE Amemiya Racing RX7 FD3S. The car raced in the All-Japan Grand Touring Car Championship (JGTC) where it waged war in the GT300 class competing against several factory teams racing expensive Euro cars with massive budgets. The RE Amemiya RX7 proved to be a giant-killer – consistently placing high in the standings and even winning the Malaysia Sepang round in 2000. The car was notable for its performance, but more so for the man behind it, the legend that is Isami Amemiya. The crazy part about this car, and I am ashamed to admit it, is it had existed in my hometown of Perth for the best part of nine years and nobody had a clue about it! If there was ever was a bloke who was in the right place at the right time, it had to be Hugh O’Brien: “We had a car up at Barbagallo Raceway and were working on it when an old bloke walked over and told me he had a rotary race car back in his shed at home. It had been there for a while and it hadn’t been raced since it came from Japan. I kinda shrugged it off like it was another guy rabbiting on. He offered me the chance to look at it, so I thought what the hell, it might be worth it. I couldn’t believe my eyes when I got there. I knew it was the RE Amemiya RX7 even though it had a shocking black paint job. I asked to buy it but the guy wasn’t interested. I left disappointed, but out of the blue six months later, he called me and said I could have it. He wanted it gone. I didn’t hesitate, I was up there that day,” said Hugh. Hugh took the car back to his workshop in Kewdale and it was promptly stripped: “I wanted to rebuild the whole car. Take it back to its former glory. When we started pulling it apart, you could see remnants of the yellow paint. It proved that we had the real car and it helped us match the colour too.” Hugh then scoured the internet for photos of the old livery so he could have the correct decals made up, even with their amusing English translations included. Still fitted to the car thankfully, were the centre-lock, Desmond Regamaster Evo 18-inch wheels. The shell is pretty damn cool too and it’s not just a ‘tacked on’ body kit either. The original chassis and floor remain but it was RE Amemiya who teamed up with Bomex to develop the wide panels for the car. The carbon fibre doors are pretty special too. The body was a one-of-a-kind. The motor is a 20B triple-rotor that has been peripheral ported, fuel injected and equipped with a MoTeC M4 engine management system. The air-intake restrictor mandated by JGTC regulations proved to be especially brutal for the motor. RE Amemiya had to choose a tuning direction that lowered the torque band and focused on the middle rev range to make the most out of the limited 300hp it was forced to have. To make sure the car was good for the present day, Hugh rebuilt the motor with all-new gear, including carbon apex seals. To truly appreciate the car, you need to hear it – the thing is insane! The drivetrain features a Hewland 6-speed dog box with an RE Amemiya twin-plate clutch and a Mazdaspeed LSD. Most of the suspension is custom stuff with chromoly subframes front and rear, RE Amemiya Quantum coil-overs all ’round and a braking system that is best described as extreme – try Brembo 380mm discs up front and 335mm rear units. Hugh actually had the car for sale last year and completed the rebuild for a New Zealand buyer Aidan Barrett who had dreamed of owning the car ever since he was a kid. As a teenager, Aidan was fortunate enough to be visiting an uncle who lived around the corner from RE Amemiya in Japan. Originally, Aidan was going to complete the build himself back in NZ, but with a debut at WTAC looming, Hugh decided to complete the project and deliver it to one very excited Aidan. That first drive must have been incredible! Dreams can come true.